Wash fruit if needed. Remove stem from the strawberries, but leave them whole, Cut other fruit into 1-inch chunks. Arrange chunks of fruit on 10 kabob sticks, alternating fruit so you have 2 to 3 of each fruit on the stick. I like to start and end with a strawberry. Melt butter in a double broiler. Add Nuggets and melt on low. Remove from heat as soon as soft to stir. Line up fruit kabob close together. Drizzle chocolate over fruit in a zigzag pattern. 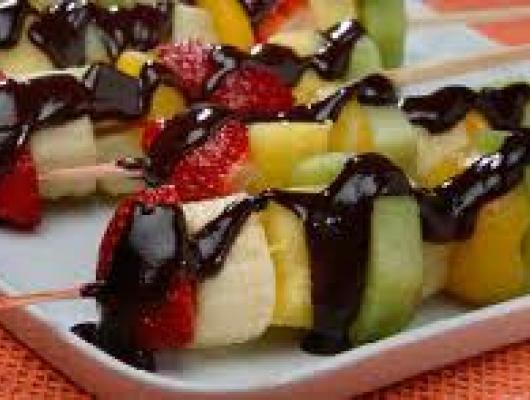 Delicious, ripe fruit covered in Healthy Dark Chocolate is a heart healthy treat you will be proud to serve at your next BBQ!